Good News & Great Joy! Paper collage on acrylic painted background. All unique vector lettering and badge for an orchard. Type style originated from research on cursive typewriter typefaces. 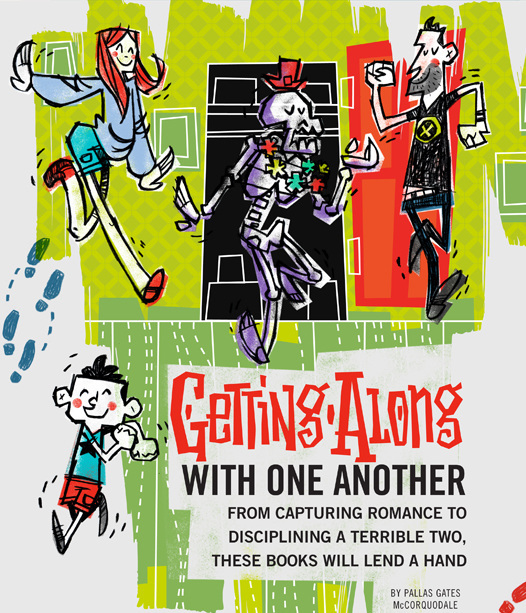 Custom Vector “Getting Along” Lettering and Illustration for a book review article. Top perfin lettering custom designed for project. Unofficial badge to be used as a floor decal for an exhibit at a college. In the end the details were removed and it was simplified to just a circle and the lettering out of a wood-pattern vinyl. N,P and O were duplicated from the Glacier National Park entrance sign. S and 1 were designed by myself to match. Custom Christmas lettering project for painted signage. Custom vector lettering for corporate eCard. Custom lettering and illustration for the state-wide reading program. Hand-painted in Ink and some Photoshop. Custom lettering and illustration to promote an event with Discovery Park of America.